The Constitution bench hearing challenges to triple talaq, today rejected Centre's plea to also decide validity of polygamy and nikah-halala but assured the issues will be kept open and "decided by an appropriate bench at an appropriate time". On the third day of hearing commencing arguments for the Centre, AG Mukul Rohatgi said all three issues triple talaq, nikah halala and polygamy were interlinked and court should decide on the other two also. 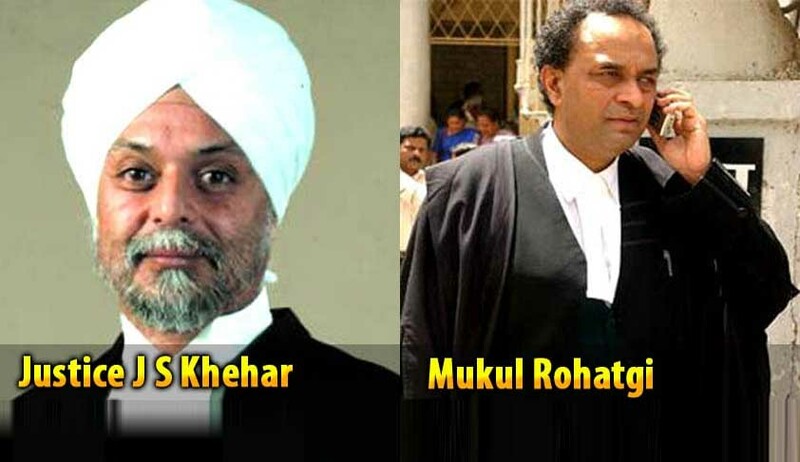 "All 3 are before the court by virtue of a reference made by a two judge bench and the prayers in the petition before the court" AG Rohatgi said. Then Chief Justice J S Khehar said:" we have taken a conscious decision that we will look into triple talaq only. We will but keep the issues open. It will decided later". All forms of talaq are unconstitutional and have to be struck down. AG gave personal assurance that if the court does that there would be no legislative vaccum and centre would immediately enact a law. Court must exorcise talaq and hold it as immoral and violative of Art 14, 15, 21 and 51. When Indira Jaising asked to AG 'why can't u do it now', AG said Supreme Court is the upholder of constitutional rights upon which CJI said we are also upholders of minority rights. CJI also said that tenets of a religion cannot be tested by judicial review. AG also said that a large number of Muslim countries or countries with overwhelmingly large Muslim population, such as, Pakistan, Bangladesh, Afghanistan, Morocco, Tunisia, Turkey, Indonesia, Egypt and Iran have undertaken significant reforms and removed the practice of ‘instant triple talaq. The Centre had earlier filed two affidavits in the apex court opposing such practices. The government had said there is no reason that women in India should be denied their Constitutional rights' when "Muslim countries where Islam is the state religion have undergone extensive reform" in this sphere. "The fact that Muslim countries where Islam is the state religion have undergone extensive reform goes to establish that the practices in question cannot be regarded as integral to the practice of Islam or essential religious practices. Secularism being a hallmark of Indian democracy, no part of its citizenry ought to be denied access to fundamental rights, much less can any section of a secular society be worse off than its counterparts in theocratic countries, many of which have undergone reform," said the government's affidavit. The Centre argued that triple talaq is 'misplaced' in a secular country like India.